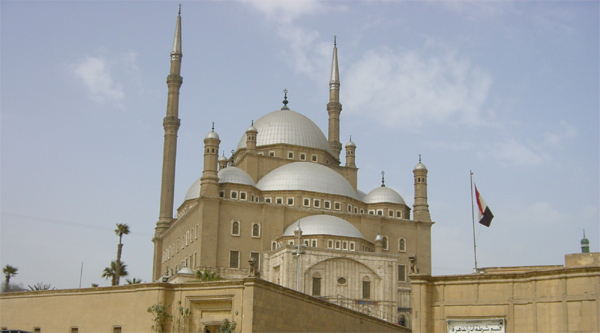 The main landmark of Cairo, it is shown from many parts of Cairo. Designed in late Turkish style and executed in white marble the mosque is a copy of famous Haga Sofia mosque in Istanbul. The mosque is constructed in Turkish imperial (Ottoman) style, like those in Istanbul, and Muhammed Ali consciously planned his mosque to be very large and visible. Typical of Ottoman mosques, it has a vast central dome that creates a grand, open interior. In addition, the two pencil-shaped minarets, eighty-three meters high and fixed at the front corner of the mosque, are Ottoman in style. Another element of Ottoman mosques followed here is the immense courtyard with central fountain, stretching in front of the entrance. 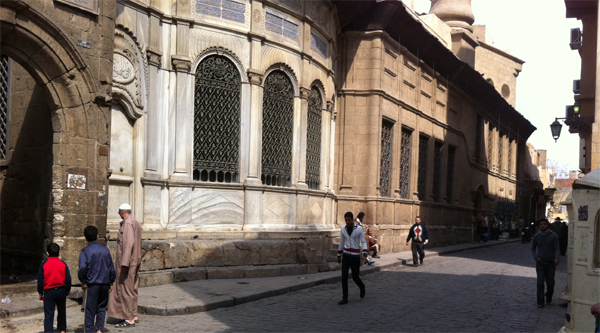 Entering a courtyard of the mosque you find a charming Turkish baroque ablution fountain, which in its individual and collective features is very similar to other sabils of the Mohammed Ali dynasty around Cairo. Notice the lush acanthus fronds around the sides and the painted landscape scenes inside the domed roof. On the north side of the courtyard you will see a clock tower on the west wall, a gift from the French king, Louis Philippe, to Mohammed Ali in 1846 in exchange for the obelisk of Ramses II taken from the front of Luxor temple, which had been erected in the Place de la Concord in Paris in 1883. The clock has never worked since the day it arrived. 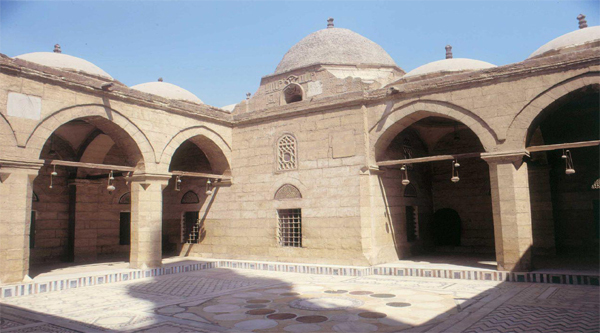 The plan of the mosque consists of a great central dome supported by four semi domes, one on each side, with four smaller domes, one for each corner. The interior’s size is impressive – it can hold up to 6,500 people – and it shows the wonderful arrangement of mass and space that is characteristic of the Istanbul mosques. Directly inside the mosque on the right side you will find a bronze screen surrounding the marble tomb of Mohammed Ali, who died in 1848. On the right side of the mihrab niche stands the original wooden minbar decorated with gilt ornament. King Farouk gave the smaller, alabaster minbar to the mosque in 1939. 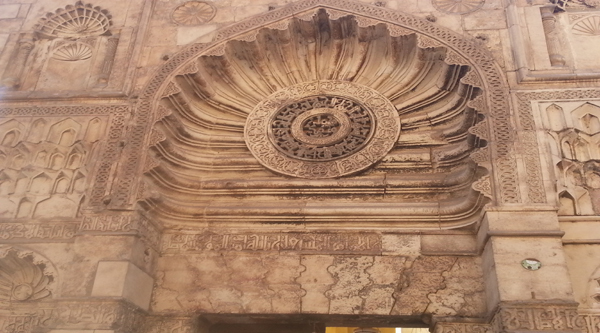 The mihrab niche is quite deep and protrudes on the exterior wall of the mosque. 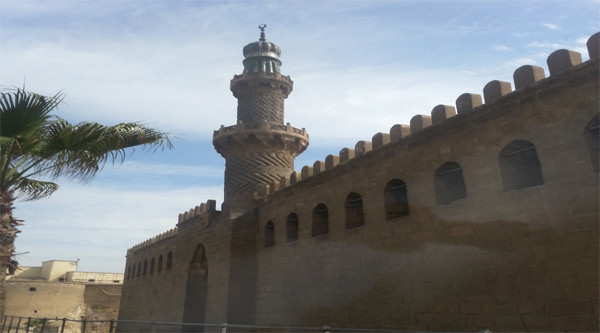 This is a Cairene feature that goes back to Fatimid times. Around the dome are six large medallions with the names of God, the Prophet Mohammed and the first four caliphs. Structurally, the mosque has not enjoyed good health. Toward the end of the 19th century it showed signs of cracking, and the masonry in various parts was reinforced. By 1930 major cracks had appeared again, especially in cupolas, and the condition became so dangerous that a scheme for a complete overhaul was drawn up. Between 1931 and 1939 the domes were demolished, rebuilt, repainted and gilded. In 2001 it had been regilded and cleaned once again. 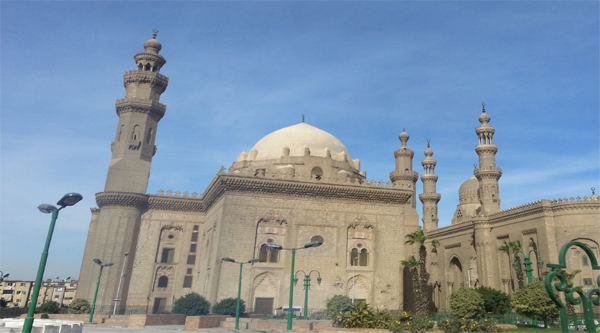 After you finish exploring the mosque, go around behind to its southwestern side and walk over to the parapet, from which there is an excellent view of Cairo. Directly in front of is the fortress-like Madrasa of Sultan Hasan, flanked by the mosque of al-Rifa’i. To the west, in the left quadrant, a unique minaret of is the great mosque of Ibn Tulun will be seen. Off to the south, one can see the Tomb of Imam al-Shafi’I, and on a clear day the Pyramids of Giza are visible on the horizon. Looking north one can also see from this point Bab Zuwayla, al-Azhar and other monuments of Fatimid Cairo.